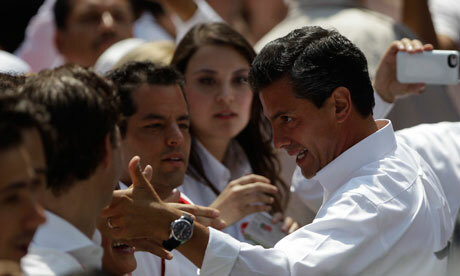 Mexican Election: Did Media “Fabricate Popularity” of Apparent Winner? Professor at the Institute for Legal Research at the National Autonomous University of Mexico, Ackerman said today: “Mexico apparently has decided to turn back the clock. Widespread frustration with twelve years of uneven political progress and stunted economic growth under the right-wing PAN [Party of National Action], has led to the desperate move of calling back to power the old guard PRI [Party of the Institutional Revolution]. Meanwhile, in a repeat of the last presidential race in 2006, the left-wing PRD [Party of the Democratic Revolution] has once again been left in a close second place. “[PRI candidate] Peña Nieto also owes his apparent victory to the television duopoly which has literally fabricated his popularity out of thin air. The recent exposé by The Guardian of enormous secret contracts between him and the television companies for the purpose of promoting his image, are only the tip of the iceberg. Upon arriving in office, the new president´s first priority most likely will be to pay back this invaluable support through new laws and regulatory measures. Such a deal would also inevitably involve protection for the Peña Nieto administration from uncomfortable media oversight and accountability.” See Ackerman’s interview Monday morning on Democracy Now. Irma Eréndira Sandoval is professor of political science and coordinator of the Anti-Corruption Laboratory at the National Autonomous University.